For downloadable chess puzzles, click on /Chess/ in the menu above. You need to sign up (it's free) to access these activities. Children - please ask a grown-up first. Perfect for players at all levels, illustrated with step-by-step diagrams, photographs and illustrations. Over 80 chess puzzles included to test your new-found skills. Written in collaboration with the chess Grand Master, Jonathan Rowson. Includes Internet links, which can be accessed through the Usborne Quicklinks website, and take you to approved websites that provide tips, tactics and further chess puzzles. Contains a history of the game and a comprehensive glossary. An excellent first introduction into the world of the Royal Game. I bought this book for my five year old son when he showed an interest after seeing some older children playing. It gave him a simple grounding in the rules, and was an interesting and informative read. All the rules are included as well as simple puzzles, nice graphics and diagrams. There is historical information about past masters and some facts about modern figures in the game. 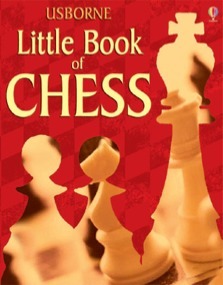 All in all, this is the perfect first step into chess and allows anyone to learn the basics.